What a treat it was, when trawling through the bookshelves one wet weekend down at the beach, to come across a Jane Gardam novel that I hadn't read. This is like discovering an unredeemed book voucher hidden in the back of your wallet. Jane Gardam is one of those writers who can take you so far into someone else's world that for days after finishing the book you find yourself wondering how the protagonist is going. She is a prolific and highly awarded English writer—think Penelope Lively, Muriel Spark— whose other books I have loved, God on the Rocks and Crusoe's Daughter especially. 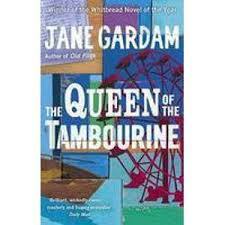 There are reams of reviews about Queen of the Tambourine and all other Jane Gardam novels of course and I'm not about to write another one. But if you haven't discovered her yet there's a world of delight awaiting you. The Queen of the Tambourine is a tale told entirely in letters written by the apparently disintegrating Eliza Peabody to her mysterious neighbour, Joan, who may or may not be missing. 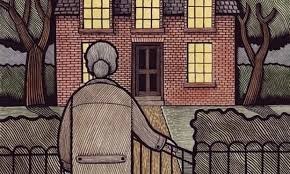 Her other neighbours in the posh South London street provide Eliza's whole context and her preoccupation. She is the ultimate unreliable narrator. So, a few of the thoughts of dippy but perceptive Eliza Peabody: "I seriously think Simon is taking drugs. He has that bright look, and there's something about his shoulder blades..."
Of modern London mothers: "...their children get themselves about the world to foreign lands at an age when their grandparents were still being taken for short walks in the park." Mr Forbes with his "skimmed-milk smile" and the visiting speaker, smoking "a very loose-looking cigarette with tobacco hanging out of it like hairs from a nose." "...the golfers in their yellow jerseys, like wandering bananas..."
Or later, Eliza's friend stares at "some polystyrene urns and a statue of Pandora, letting all the troubles of the world out of a polystyrene box at her feet. She had a join all down her sides and over her head like an Easter egg that would fall apart if you tapped it." In the fridge there is "an open tin of anchovies. Fillets of worm. Unwound it could sever an artery." And of the offspring of a family friend "The great mysteries of puberty are yet to come for these girls... " although "Grizel is getting very thick with her sports mistress." Everything so under-stated and original. The thoughts of Eliza Peabody take us along a sometimes disconcerting pathway that is well worth following, just for the privilege of being inside her head as she tries to make sense of her own unfathomable world.